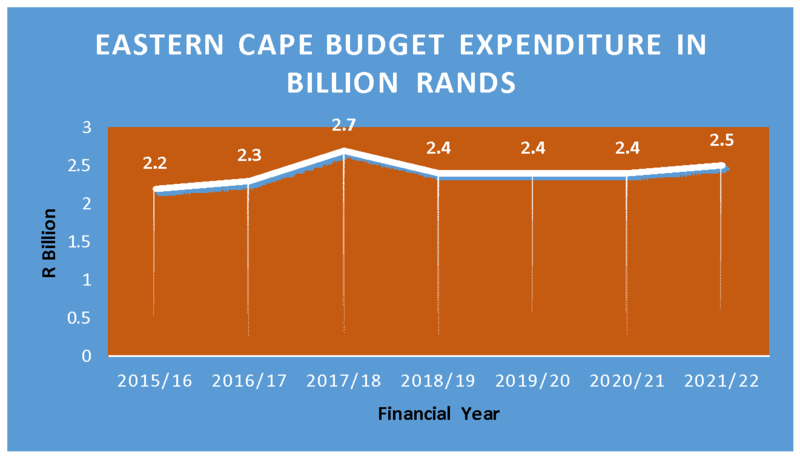 The 2019 Eastern Cape budget speech highlighted the negative effect of the revised equitable share formula that allocates provincial budgets according to the population in the province and disregards the extreme poverty in some provinces whose population is relatively low. The 2019/20 Human Settlements budget has not increased from the 2018/19 provincial budget hence a number of targets for different programmes may not be attained. The Department has resorted to reprioritisation of programmes, shifting funds from programme to programme. Reprioritization is strategically used to address human settlements delivery challenges where there is no additional funding. Unfortunately, spending on the programmes where the Department directs the funds through conditional grants, for example issuing of title deeds, do not deal with the massive backlogs in those programmes. More funding coupled with effective use of the funds is necessary for effective human settlements delivery. Table 1 below shows expenditure from 2018/19 to 2020/21. It also shows what was allocated in the medium term framework for the Eastern Cape Department of Human Settlements. R2.4 billion and R6.1 billion is allocated for 2019/20 and over the Medium Term Expenditure Framework. The Rand values in this chart are adjusted for CPI inflation and are the effective value in 2018 Rands. CPI is used as the deflator, with the 2018-19 financial year as the base. The lack of increase in the budget for the current financial year means the provincial Department of Human Settlements must make effective use of the limited budget to meet the targets set for human settlements delivery. The core functions and responsibilities for the Department this financial year include rural settlement development, informal settlement upgrading, provision of rental and social housing, provision of title deeds to beneficiaries and installation of services and amenities. It is unlikely that the Department will be able to deliver on all these core programmes over the medium term framework due to limited budget. The Department focuses on the programmes they deem to be of preeminence and need urgent attention in order to deal with historical backlogs. The 2019/20 delivery targets are shown in the table below relative to the targets for the previous financial year. There is lack of progress in the issuing of title deeds as reflected by actual delivery against targets set for 2018/19. A target of 9000 for issuing title deeds appears in Adjusted Estimates of Provincial Revenue and Expenditure 2018/19. Only 1257 title deeds were issued in 2018/19. When funds are ring-fenced to create a grant to speed up delivery in another area, the Department must ensure that those funds meet the objectives and respond to the needs of the people. When a conditional grant such as the Title Deeds Restoration Grant is created and high targets are set to speed up the process of issuing title deeds as shown in Table 1 below, it is not encouraging to then see poor performance on the grant. During the second quarter of 2018/19, the Department reported underperformance on transferring of title deeds as due to delays in the appointment of conveyancers. Such delays should be addressed in order to improve delivery. Table 1: Figures in the table extracted from the Estimates of Provincial Revenue and Expenditure 2018/19 and 2019/20. The targets in Table 1 show a general reduction on targets across programmes aside from an increase in the issuing of title deeds. Targets reduction in other programmes in order to expedite delivery in other area affirms the lack of adequate budget for all programmes. The Title Deeds Restoration Grant was introduced to deal with the backlog on issuing of title deeds with an allocation of R65.6 million in 2018/19. 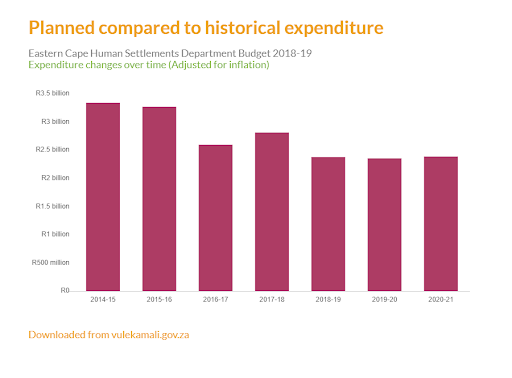 The cause for concern is that despite a target set for 2018/19 of 9000 and a grant allocated by the end of 2018/19 financial year only 1257 title deeds were issued to beneficiaries out of a target of 9000 as reflected in the Eastern Cape Provincial Expenditure for 2019. In the current financial year, the target stands at a total of 35 591 for issuing and handing over of title deeds. The question is whether the Department will be able to meet a higher target than the previous one, given the dismal performance in 2018/19.